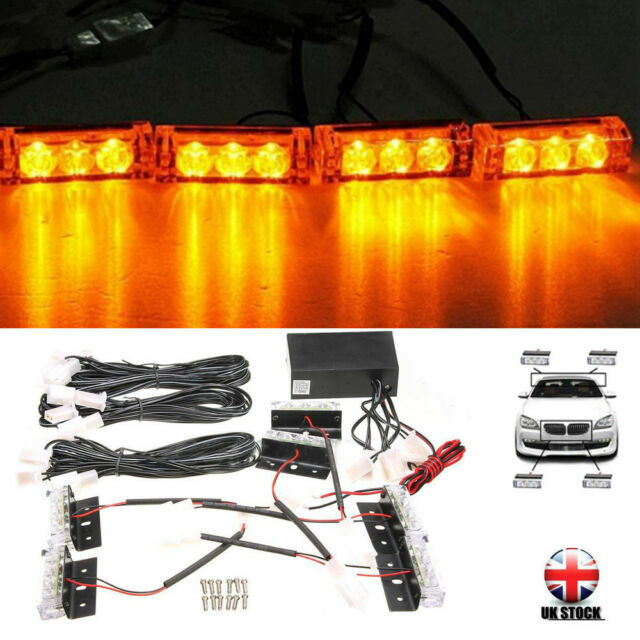 Car 12V 6 Amber LED Flashing Grill Lights Bar Strobes Warning Recovery Breakdown. -Recovery vehicles, Trucks, Breakdown Vehicles, etc…. -Three different flashing modes. 3 Flashing modes as stated below. Lights not really manufactured with wet weather in mind. The plugs on the extension cables are not a firm fix with the lights so may not illuminate. In my case after a few days installed both of the transistors in the controller burnt out so would not recommend them for use over a length of time. However when they work they do look very good. I think that if you were going to install these to dispense with the plugs and make more permanent waterproof connections so the controller is not shorted out by rain causing the damage to the transistors. The lights are great. However the brackets are made up of thin sheet metal and go rusty on the ends so I made a new set of brackets but apart from that they are a great set of lights would recommend them for any vehicle. WHITE 24LED LIGHT RECOVERY STROBE FLASH EMERGENCY BAR MAGNETIC BEACON LAMP 12V !